Set in the summer of 1959, when the impact of European migration and the rise of women's liberation is about to change Australia forever, a shy schoolgirl takes a summer job at the prestigious Sydney department store, Goode's. 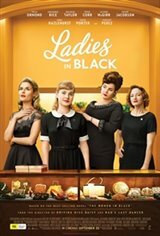 There she meets the "ladies in black", who will change her life forever. Beguiled and influenced by Magda, the vivacious manager of the high-fashion floor, and befriended by fellow sales ladies Patty and Fay, Lisa is awakened to a world of possibilities.